As promised, today we’re going to dig deeper into creating effective landing pages, but only for you Internet Marketing for Smart People subscribers. I’ll also give you a few hints about our upcoming landing page software for WordPress called Premise. Before we get into making landing pages better, let’s make sure we’re using landing pages in the first place, and understand why they’re so important. A lot of people don’t realize that before all of his fantastic books about online marketing, Seth Godin founded an online email marketing firm called Yoyodyne in the 90s, and sold it to Yahoo for a bundle. He then wrote Permission Marketing, the most important book on marketing for me when getting started back then. Get a visitor to give permission for you to follow up by email, phone, etc. You’re probably already using online content marketing in your blog posts and articles, to get people to comment, tell a friend, or subscribe (hopefully all three). But you can take it much further. The next step is to use specifically-designed pages that focus on clicks (for affiliate marketers), buying (for people with products or services), or permission (to get leads and build your email list). It’s all about action from traffic, not traffic for its own sake. Other than avoiding obvious mistakes that cause clutter and confusion, a good landing page works because of good fundamental copy. It’s not award-winning design or a cutting-edge layout — in fact, those designer elements are likely to hurt, not help, conversions. Case Study: Copy Vs. Design: Which is Most Important to Conversion? So many people fail or forget to include basic fundamentals of solid copy when crafting landing pages. You don’t need to be a master copywriter to create landing pages that work, but you do need a grasp of the basic building blocks of good copywriting. 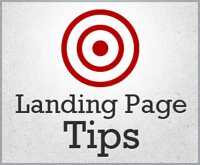 Then you just need to know how to apply those in the context of each type of landing page. What makes a landing page great? The thing that separates a good landing page from a great one is the premise. No, I’m not talking about Premise, our upcoming landing page software. I’m talking about the concept that inspired the name of the software — the premise. As a term in formal logic, the premise is a proposition supporting a certain conclusion. Applied to copywriting, I use the word premise to mean the emotional hook that not only attracts attention, but maintains engagement throughout every element of your landing page copy. In other words, the premise weaves itself from headline to call to action, tying everything together into a compelling, cohesive, and persuasive narrative with one simple and inevitable conclusion — your desired action. When it comes to executing on the premise for a landing page, it helps to have a persuasive writing structure to make sure you hit all the elements. Many people rely on AIDA (attention, interest, desire, action) as a preferred guide, but I always found those elements too broad and vague. How does Premise (the software) help? Quickly and easily build 6 crucial landing pages types, no matter which WordPress theme you’re using. This includes a custom graphics library and point-and-click design controls that allow you pinpoint control without code. Copywriting advice built right into your WordPress interface for each kind of landing page. You’ll no longer have to flip frantically through copywriting books or search online for ideas. The Premise Guide to Effective Landing Page Copy fleshes out in much greater detail how to find a killer premise, and more importantly, how to execute on it. Plus hours and hours of seminars on copy and conversion optimization. Premise does even more than this, but I want to cover one more important topic next week before we dig deeper. Stay tuned. Get here from a link from a friend, Twitter, or Facebook? Get more landing page tutorials plus a 20-part free email course on the essential pillars of internet marketing that works, without the hype and sleaze. Learn more about it and sign up here.